Roasted Pineapple & Ham Quinoa Salad is an easy recipe using up leftover ham with the perfect combination of sweet, salty and smokey flavors. 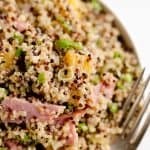 Crunchy quinoa and oven roasted pineapple and ham are tossed with a Light Honey Dijon Vinaigrette for an easy 5 ingredient salad. Are you lucky enough to still be sitting on a stack of ham in the refrigerator from Easter? 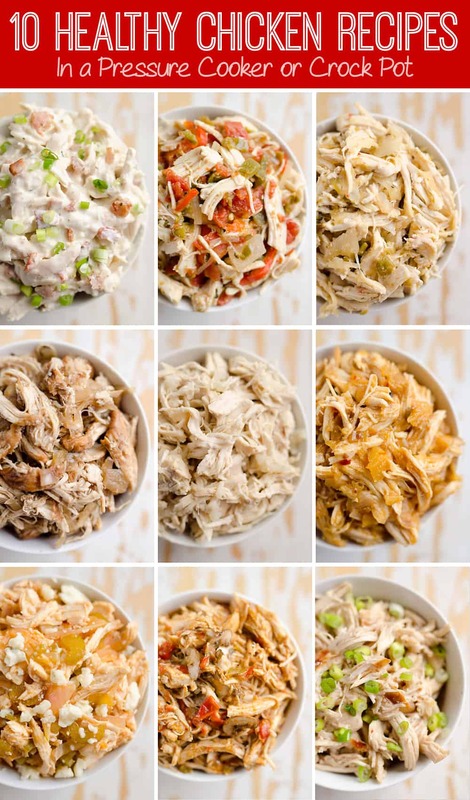 It is great on sandwiches with all of the leftover salads from the holiday, but at a certain point you just need to change things up with the leftovers. 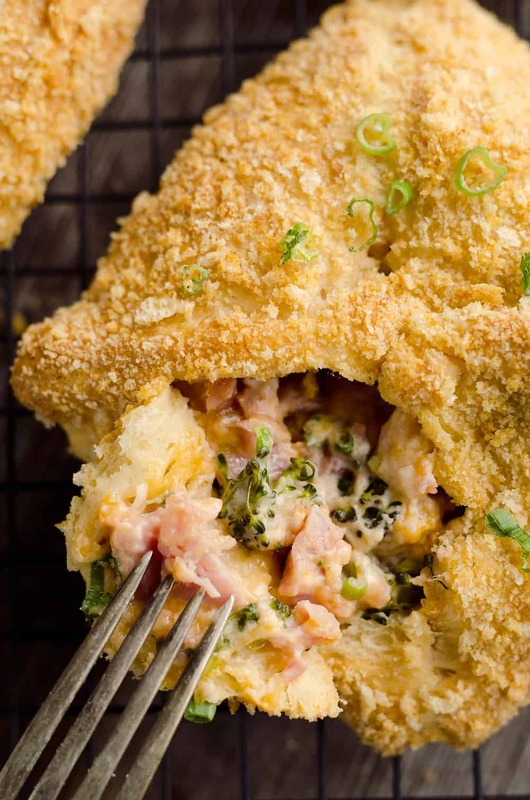 These Cheesy Hot Ham & Broccoli Crescent Pockets or this Roasted Pineapple & Ham Quinoa Salad are the perfect way to change things up! We all know that ham and pineapple are an amazing flavor combination. Personally, it’s the only way I will ever order my pizza! 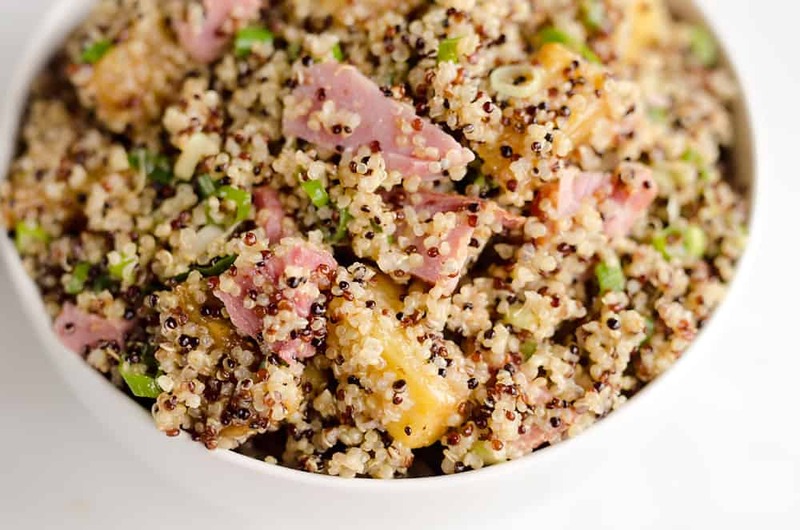 With this Roasted Pineapple & Ham Quinoa Recipe, I decided to lighten things up. 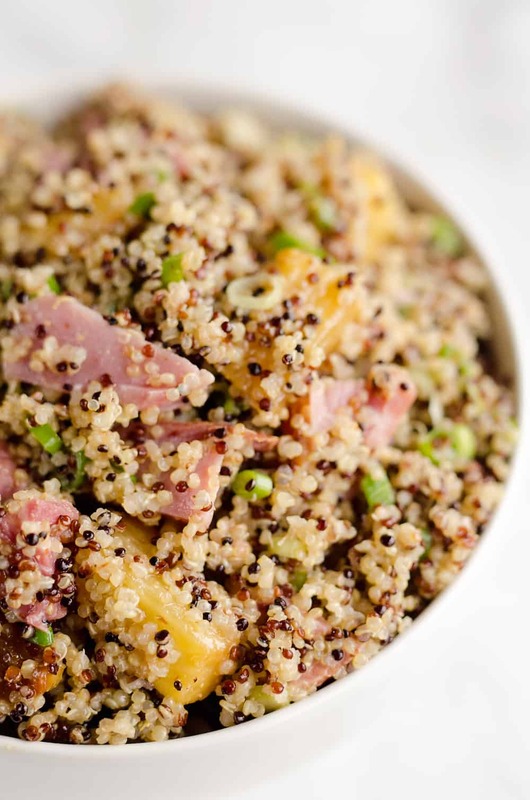 Wholesome quinoa is tossed with leftover ham, pineapple, green onions and a homemade Light Honey Dijon Vinaigrette. It almost sounds too simple to be good, but the combination of the salty and smokey ham paired with the sweet roasted pineapple is so refreshing and delicious. I keep going back for more! The beauty of this particular salad is that not only does it use leftover ham in the recipe, it uses the leftover roasted pineapple you cooked with your ham on the holiday! If you are one of those people who don’t bake your ham with pineapple, well then I just don’t understand you. To each their own I guess! 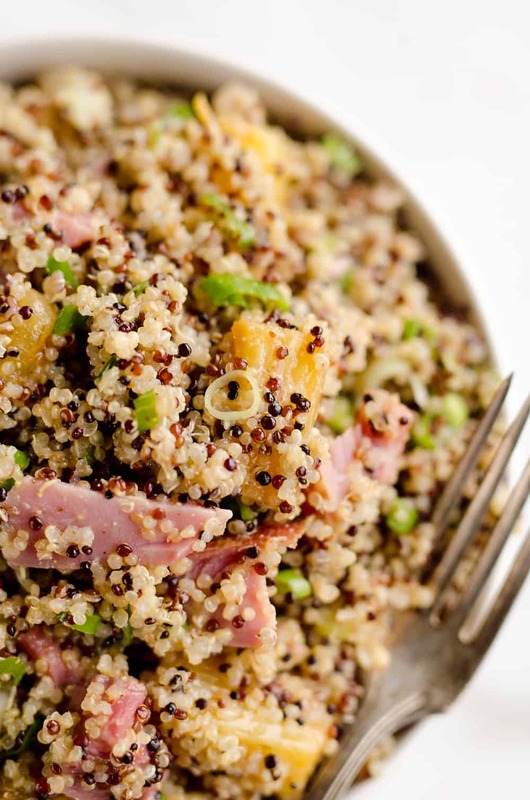 BUT, that doesn’t mean you need to miss out on this Roasted Pineapple & Ham Quinoa Salad. Simply toss your pineapple with a drizzle of olive oil and pop it in the oven. Bake it for 10-15 minutes until it is perfectly sweet and golden. Roasted or grilled pineapple is so much better than it’s uncooked counterpart in my opinion. The meat of the fruit is softer and more importantly sweeter. I adore roasted pineapple with just about any savory dish. These Roasted Jalapeño, Pineapple & Chicken Tenders are a particular favorite of mine as well! I know quinoa can be a tad overwhelming, but it is really so easy and loaded with tons of protein and fiber. 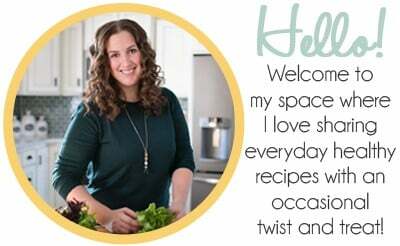 It is a must try for anyone looking to make some healthy meals. This salad may not look overly impressive, but I promise you once you try it, you will be hooked! Toss all of the ingredients in a large bowl with the vinaigrette until well coated. Serve immediately or store refrigerated. LOVED this dish! 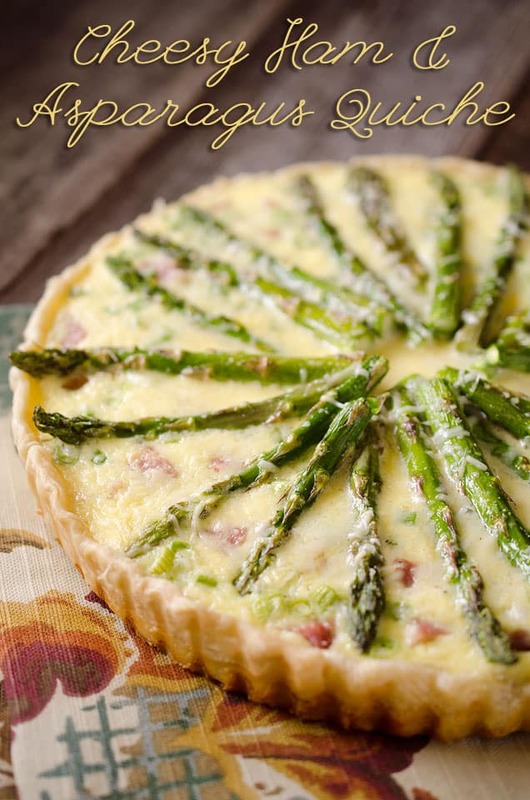 Easy, quick and so delicious! All of the flavors complemented each other so well. Plus, it was fun to try something different with left over ham.